Picking up a utensil to feed one’s self is a luxury that people take for granted. For others with neurological conditions causing tremors, this basic activity can be a source of frustration and embarrassment. GYENNO’s ‘Smart Spoon’ tries to eliminate that problem. It’s a stabilization utensil gadget that offsets 85 percent of unwanted tremors for users affected by diseases like Parkinson’s. The spoon has been in production for almost a year, and was revealed at the Consumer Electronics Showcase in Las Vegas last week. While GYENNO’s product is still new to our consumer’s market, the technology has been employed in China for a while. The utensil uses sophisticated stabilization control algorithms and motion learning technology to adjust to the user’s tremors, helping the person eat regularly. 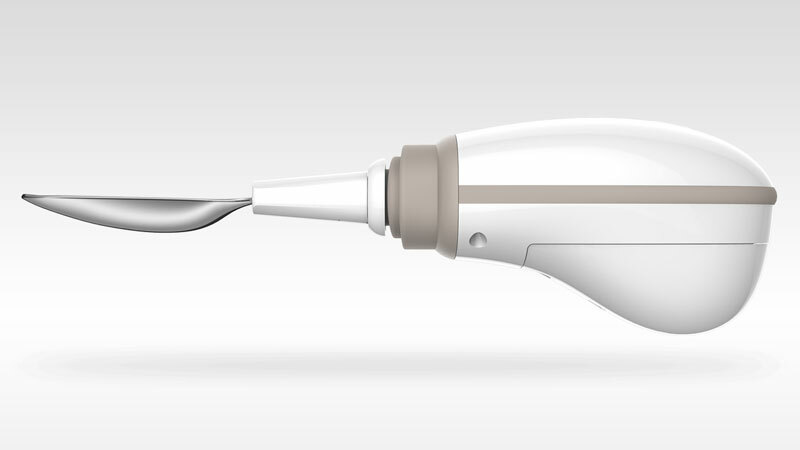 The Smart Spoon is similar to another stabilization utensil from Lift Labs, a Google purchase back in 2014. GYENNO holds a patent for their own spoon’s tech, which they’ve called the best on the market. “We use special PID [proportional–integral–derivative controller] control technology and attitude stabilization technology to make a better performance, higher frequency response and more accurate position control,” said Dehuai Li, marketing officer at GYENNO, in an interview with Motherboard. GYENNO Spoon already has hundreds of users, and have raved about being able to feed themselves once again, Li said.